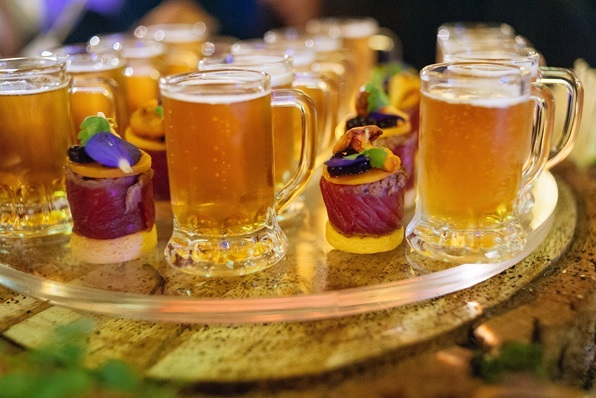 Westerham Brewery Viceroy India Pale Ale supports Easy Gourmet Catering Canapé Cup 2017 win! At SquareMeal Venues + Events Live 2017, eleven caterers put their miniature masterpieces forward to contend for the coveted Canapé Cup. Easy Gourmet Catering presented not just a canapé, but an entire experience: specifically, a woodland festival. The setup included mini-bunting, ‘moss’, mushrooms, a ‘festival pass’ listing all the ingredients and, in the middle of all that, a special gluten-free beer pairing. To start, a wonderfully tender slice of English sirloin wrapped around truffle- and balsamic-flavoured caviar, sat on a parmesan shortbread, topped with wild mushrooms and edible flowers. This was followed by a gulp of Westerham Viceroy India Pale Ale in perhaps the dinkiest ‘pint’ glass ever. All in all, a decadent combination of flavours, and visually on point. Pretty impressive for a first-time entry.